Rear Rotor Outside Diameter (in): 13.500 in. 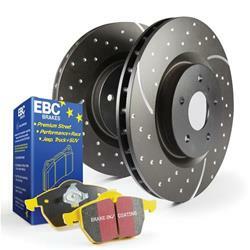 Upgrade the brakes on your ride using these EBC Stage 5 Superstreet disc brake kits. They include a pair of EBC dimpled and slotted rotors featuring a great looking and corrosion-resistant GEOMET coating plus, a set of Yellowstuff Aramid brake pads. Stop quicker, stop better, with EBC!